I have never been a big fan of ‘fast-food’ pizza, especially after I worked at Pump It Up (the inflatable party zone!) for awhile in college. That is all we were allowed to serve and nothing against Papa John’s, but after you have served hundreds of cheese, pepperoni, sausage, etc pizzas and for the most part were given the left overs by the parents who didn’t want to take it home, it would be to soon if I ever ate a fast-food pizza again! But I do love pizza, homemade that is. Andrew and I have had pizzas on Pillsbury rolls, whole wheat pitas, subs….but tonight we are having a different kind. One that is completely homemade (except the cheese and I found a simple mozzarella cheese recipe, but can’t find cheese salt, citric acid, or rennet tablets anywhere in our small town). From there I was sent to The Frugal Girl: Wednesday Baking-Whole Wheat Bread where I made the whole recipe, but then made half the dough into the pizza crust and the other half into a loaf of bread (oh my word, her bread is sooo much yummier than the one I have been making!). Okay, now that you have all those links, here is how mine turned out. This is before I baked it. And this is after! YUM! my crust is that dark because I was really bad and brushed it with garlic butter before baking it…shhh! 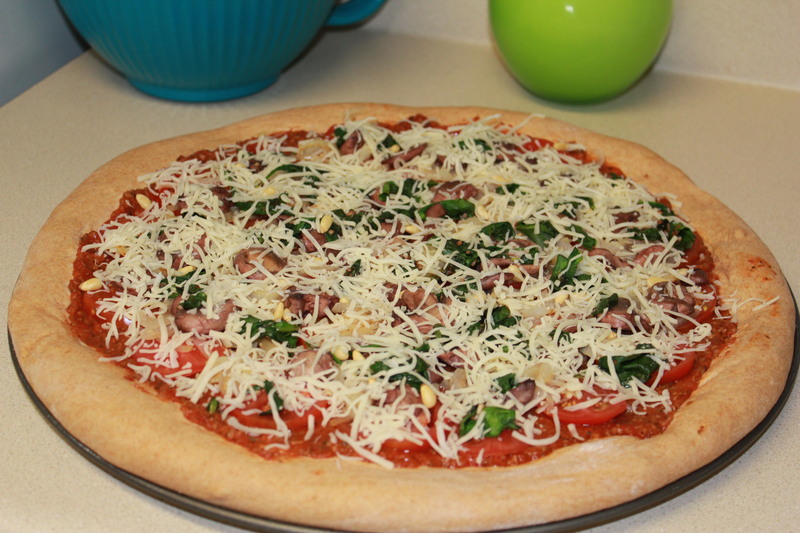 In case you are wondering what I put on it, well, I used the sauce I told you about, then I sliced up tomatoes, sauteed onions and spinach in olive oil and garlic, then sauteed mushrooms in red wine, then topped it with pine nuts and cheese.